Quentin Anthony Anderson is a Baton Rouge, Louisiana native who leads Groundswell's communications and public affairs efforts as it's Associate Director. He is a dynamic non-profit & communications professional with years of experience working with community-based organizations, and a rich background in social justice, political & community organizing, and policy advocacy. In 2015, Q led a statewide coalition of high school-aged young people in Illinois during their school discipline reform campaign, resulting in one of the nation's most comprehensive school discipline reform bill ever signed into law. Prior to that, he served as Regional Field Director for NextGen Climate, helping lead GOTV efforts in southwest Colorado during the 2014 congressional midterm elections. 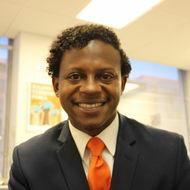 Quentin earned his JD and graduate degree from Louisiana State University, his BA in Political Science from Louisiana Tech University, and has previously worked for United Way, The Justice Alliance, and Obama for America. Groundswell's Quentin Anthony Anderson reflects on his recent attendance and participation at the first annual Coalition for Community Solar Association Summit in Denver, CO this past July.